Looking back to 2016 provides a broader view of the trends we're seeing. Premium publishers declined slightly year-over-year, giving up three percentage points to media aggregators and netting out at 68% vs. 32% respectively. CTV is driving the resurgence of the 30-second ad. The percentage of impressions for 30-second ads in full year 2018 saw an increase of 66% over full-year 2017. At the same time, the declines in mobile and desktop viewing by consumers led to a significant decrease in the share of impressions for 6-second ads, which declined 46% year over year. 15-second spots, which held the lion’s share of impressions throughout 2017, declined 33% from full year 2017 to full year 2018. 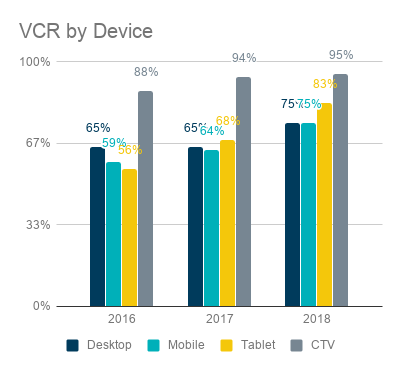 While mobile dominated video ad impressions throughout 2017, peaking in Q4 with a 39% share, CTV surged ahead in 2018 and the full-year comparison is dramatic. In 2017, CTV accounted for just 16% of ad impressions by device. 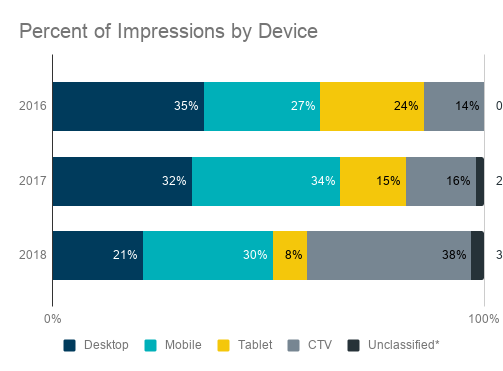 In 2018, CTV captured 38%, winning impressions from all other devices: desktop, mobile and tablets, which averaged for the year 21%, 30% and 8%, respectively. 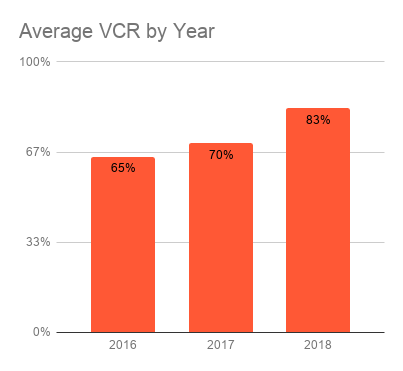 While video completion rates are up for all devices, CTV is the winner in the category with 95% of ads playing all the way through. 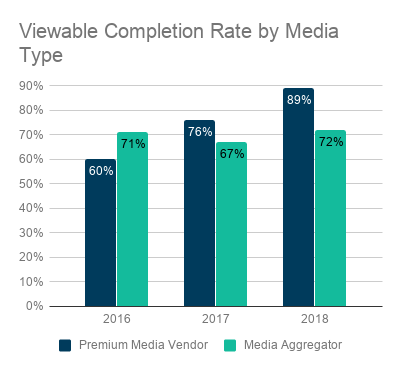 For media type, premium publishers hit a new high of 90% completion rate and aggregators rose too, with an average of 69% for 2018. 30-second ads held the lead over 15- and 6-second spots for the three years captured in this report. 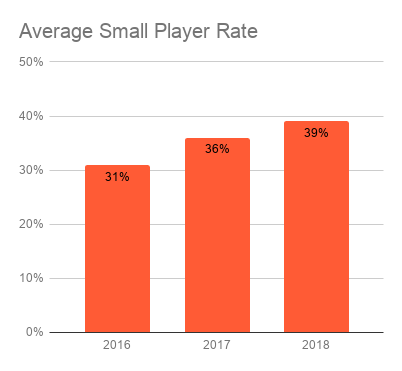 Click-through rates overall have been in decline for three years. 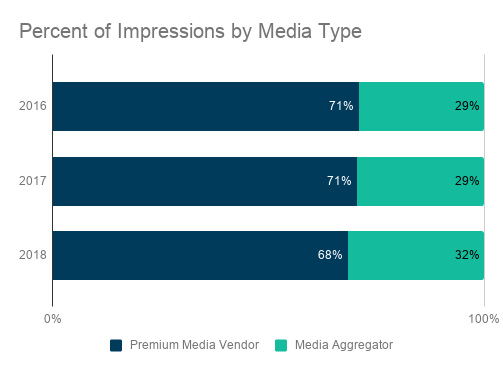 Rates are stronger among aggregators than for premium publishers, likely because advertisers investing in premium inventory are prioritizing sustained viewer attention over click-throughs as a campaign goal. 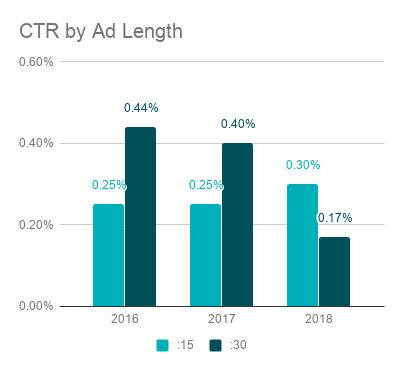 The tremendous increase in CTV impressions served also had a big impact on the overall decrease in CTR because viewers do not typically have a click-through option with ads on CTV. 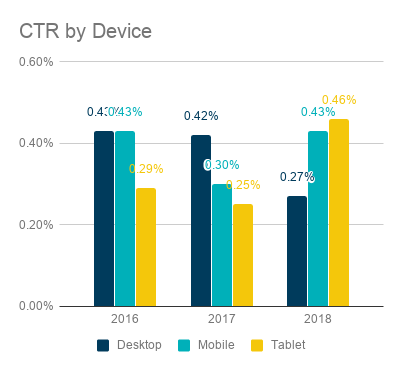 Mobile and tablets have both shown an increase in click-through rates, indicating that marketers set different goals for impressions served on those devices. High frequency/outlier activity tops the list of reasons for filtering General Invalid Traffic, but the percentage of filtered impressions is low and getting lower. The overall GIVT rate for full year 2017, 6.2%, dropped to 3.97% for full-year 2018. In that same time, the average of high frequency/outlier activity dropped from 5.46% in 2017 to 3.41% for full-year 2018. The aim here, for publishers and advertisers, is to keep traffic generated by non-human means to a minimum and the percentages we see are going in the right direction. High frequency/outlier activity is also the primary reason for GIVT on premium publisher sites. 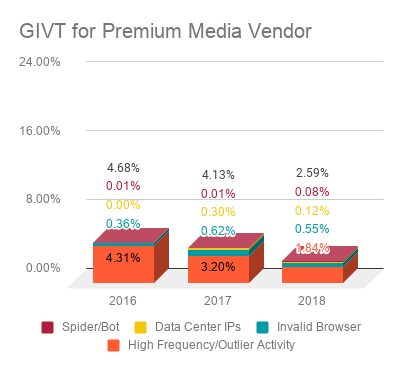 Levels are consistently lower than those seen on aggregator sites and we’ve seen a decreasing trend of overall GIVT among premium publishers over the past three years. 2018 finished with high frequency rates down from an average of 3.2% for full-year 2017 to an average of 1.8% for full-year 2018. The three year trend for general invalid traffic among aggregators shows a steep decline. In the past year alone, we’ve seen a decrease of 37%, from 10.87% in full-year 2017 to 6.83% in full-year 2018. 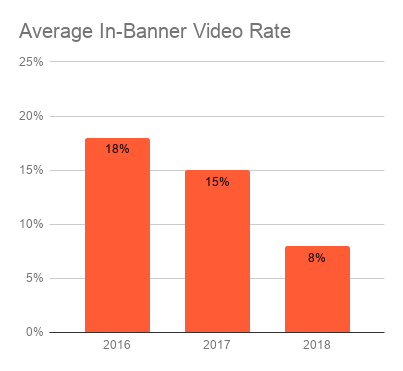 In-banner video rates continued a steady decline in 2018, across media types, landing at 8%. 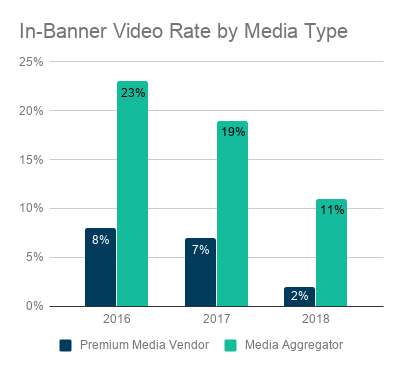 The rate among both media aggregators and premium publishers decreased over three years, though aggregators still account for the large majority of in-banner video at 11% for 2018 vs. 2% for premium sites. 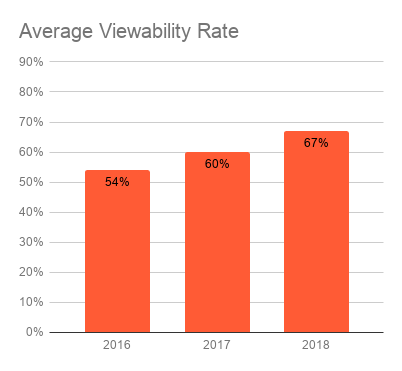 Viewability rates continued to increase across media types and ad lengths in 2018, which is good news for advertisers. 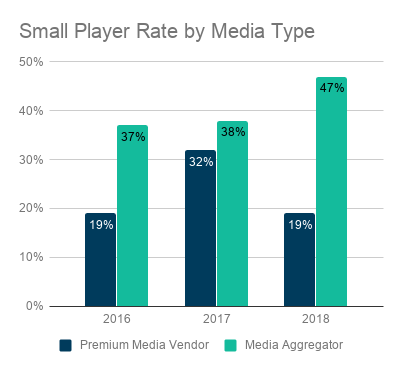 Both premium publishers and media aggregators saw rates rise, with premium publishers maintaining their lead over aggregators, finishing the year at 81% and 62% respectively. 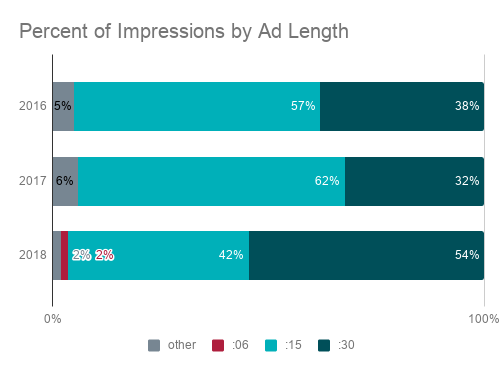 30-second ads consistently earned a higher percentage of viewable impressions than 15-second ads in 2018, with year-end averages of 76% vs 63% for 15-second spots. Percent of impressions, both viewable and played all the way through. 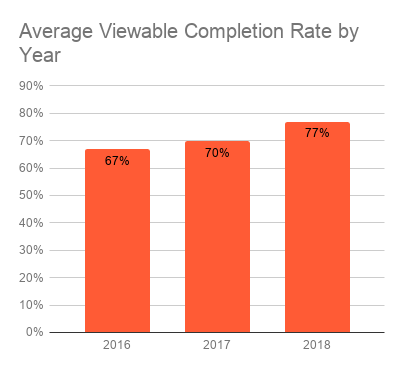 Viewable Completion Rate is a subset of Viewability. 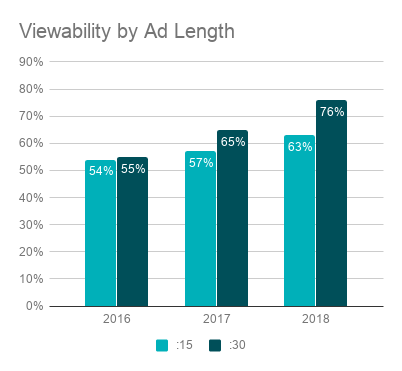 In 2017, 15-second ads definitively dominated 30-second ads in viewable completion rate. 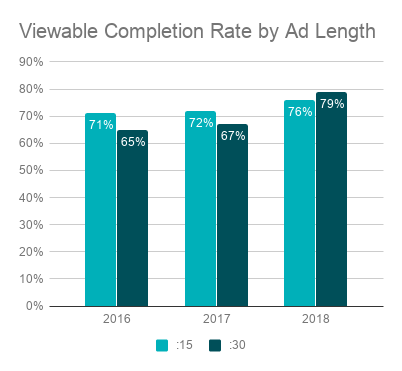 But in 2018, 30-second ads edged into the lead experiencing higher rates of growth in viewable completion rate than the shorter spots. 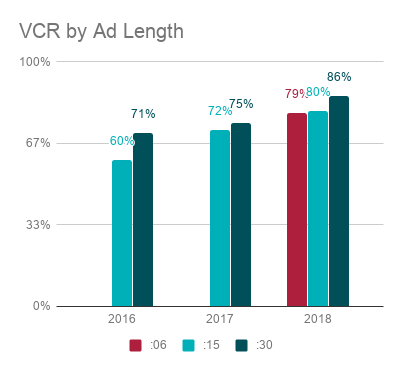 Full-year averages for 2018 were similar, with 30-second ads showing an increase in viewable completion rate of 18% vs. 6% for the shorter ads. Viewable completion rate is a subset of viewability, above. 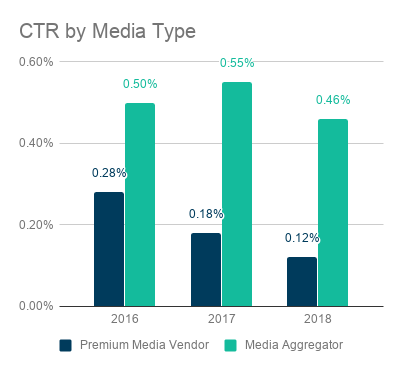 In 2018, premium publishers generally held a large lead over media aggregators. At year end, viewable completion rates for premium publishers reached an average of 89% for full-year 2018, while aggregators averaged 72% for the year.